Arndt J.W., Oyama M.A. Balloon valvuloplasty of congenital mitral stenosis // J Vet Cardiol. 2013 Jun;15(2):147-51. Radiographic, echocardiographic, fluoroscopic, and angiographic images from 2 dogs with severe congenital mitral valve stenosis that underwent cardiac catheterization and balloon valvuloplasty are presented . Both dogs displayed systolic doming of the mitral valve leaflets, increased diastolic pressure gradient across the left atrium and ventricle, and decreased mitral inflow E to F slope. Balloon valvuloplasty was performed on both dogs using atrial transeptal puncture. 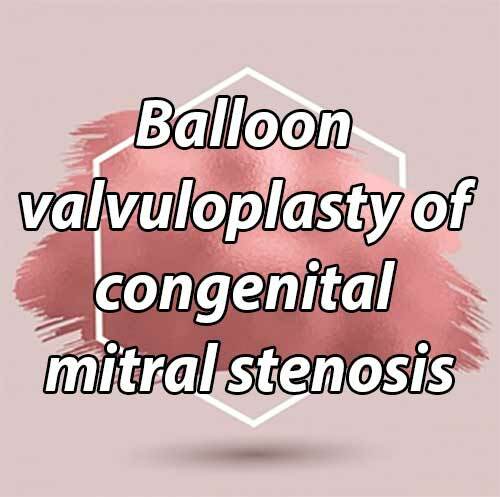 Two cases of congenital mitral stenosis were seen by the Cardiology Service of the Matthew J. Ryan Veterinary Hospital of the University of Pennsylvania. Case 1 was a 4-year-old male castrated Welsh Pembroke Corgi that presented for evaluation of a newly detected arrhythmia. An ECG and echocardiogram revealed atrial fibrillation and severe congenital mitral valve stenosis. Case 2 was a 3-year-old male castrated Vizla that presented for further evaluation after being diagnosed with atrial fibrillation, left-sided congestive heart failure and severe congenital mitral stenosis by a veterinary cardiologist from a regional referral hospital. In both cases, the poor long-term prognosis led to a decision to attempt balloon valvuloplasty(Figs. 1-3). A)	Dog from case 1. Dorsoventral thoracic radiograph reveals severe left atrial and auricular enlargement, dilated pulmonary veins, and a caudal interstitial pattern consistent with mild cardiogenic pulmonary edema. B)	Same dog as in A. Right lateral thoracic radiograph showing severe left atrial dilation, enlarged caudal pulmonary vasculature and mild pulmonary edema. C)	Same dog as in B. Transthoracic two-dimensional echocardiographic right parasternal long-axis four-chamber view of the left atrium, mitral valve leaflets, and left ventricle showing restriction of the maximal diastolic extent of mitral valve leaflet excursion. Figure 1 Radiographic and echocardiographic images from 2 dogs with severe congenital mitral valve stenosis that underwent cardiac catheterization and balloon valvuloplasty. See captions A through J in the text for descriptions. Figure 2 Fluoroscopic and angiographic images from 2 dogs with severe congenital mitral valve stenosis that underwent cardiac catheterization and balloon valvuloplasty. See captions K through U in the text for descriptions. D)	Same dog as in C. Transthoracic twodimensional echocardiographic left apical view of the mitral valve leaflets in diastole. Note the "domed” appearance of the leaflets, the "hockey stick” appearance of the anterior leaflet, and the mild nodular thickening of the leaflet tips. E)	Same echocardiographic view as in D magnified on the mitral valve leaflets. The mitral valve orifice diameter is 5 mm. F)	Same echocardiographic view as in D. Color Doppler demonstrates signal aliasing as diastolic blood flow within the left atrium accelerates toward the stenotic mitral valve orifice. High velocity turbulent blood flow beyond the orifice is seen streaming into the left ventricle. G)	Dog from case 2. Pulsed wave Doppler profile taken at the tips of the mitral valve leaflets in diastole showing increased peak velocity of diastolic mitral inflow (1.8 m/s) and a prolonged pressure halftime as determined by measurement along the abnormally shallow E-F slope. Note the presence of atrial fibrillation and corresponding lack of mitral A waves. H)	Dog from case 1. Color M mode from the left apical four chamber view reveals signal aliasing as the blood flow accelerates toward the stenotic mitral orifice. Turbulent diastolic flow is then seen within the left ventricle. A small amount of mitral regurgitation is seen in the left atrium during ventricular systole (arrow). I)	Same dog as in H. Transesophageal continuous wave Doppler profile through the mitral valve orifice from the transverse middle position. In this view the left atrium is at the top of the sector and diastolic mitral inflow moves in a posterior direction away from the probe toward the left ventricle at the bottom of the sector. Thus, mitral inflow is displayed below the baseline. The inflow signal is characterized by increased peak E wave velocity (~2 m/s), a decreased E-F slope, and prolonged pressure halftime. A partial Doppler signal of mitral regurgitation is seen during ventricular systole. J)	Same dog and transesophageal echocardiographic view as in I. The scale has been adjusted to demonstrate the full extent of the mitral regurgitation profile above the baseline as well as the diastolic mitral inflow below the baseline. K)	Dog from case 2. Fluoroscopic angiographic image during cardiac catheterization. A pigtail catheter is advanced from an introducer within the carotid artery to the aortic root and used to inject radiopaque contrast to opacify the aortic root and ascending aorta. The right coronary, left circumflex, and paraconal interventricular coronary arteries arising from the aortic root are visible. A small amount of aortic insufficiency is present within the left ventricle. A catheter with radiopaque bands spaced 1 cm apart is visible in the upper portion of the image and is used to calibrate measurements of various cardiac structures during the procedure. L)	Dog from case 1. A 8-Fr sheath for the atrial septostomy needleb is advanced from the cranial vena cava into the right atrium. A pigtail catheter is positioned from the carotid artery to the ascending aorta. A transesophageal ultrasound probe is seen in the dorsal aspect of the frame. M)	Dog from case 2. The septostomy sheath is positioned against the atrial septum and the septostomy needle is advanced out of the sheath across the atrial septum and into the left atrium. The sheath is positioned so that the transatrial puncture avoids inadvertently puncturing the ascending aorta. N)	Same dog as in M. The septostomy needle is held in place and the sheath is advanced over the needle and into the left atrium. The needle is fully withdrawn and a small amount of radiopaque contrast is injected into the sheath to confirm its location within the left atrium. Note the severe left atrial enlargement. A small line of contrast is seen in the pericardial space along the caudal border of the heart, which was the result of a previous inadvertent puncture of the left atrial wall with the sheath and injection of contrast into the pericardial space. O)	Same dog as in N. A guidewire is advanced through the sheath into the left atrium, then across the mitral annulus, into the left ventricle and out into the aorta. The sheath is retracted leaving the guidewire available for advancement of a balloon dilation catheterc along its length. The balloon is seen positioned across the mitral orifice having been aligned using the small radiopaque markers on other end of the balloon’s length. b United States Catheter and Instrument-CR Bard, Covington, GA.
c Tyshak II veterinary balloon catheter, NuMED, Inc., Hopkin- ton, NY. P)	Same dog as in O. Initial inflation of the balloon with radiopaque contrast solution demonstrates a central indentation or waist at the level of the stenotic mitral commissure. Q)	Same dog as in P. Continued inflation of the balloon demonstrates expansion of the central waist, consistent with commissural splitting. The balloon is then rapidly deflated and can be repositioned or exchanged for a balloon of a different diameter so that multiple attempts at opening the mitral commissure can be attempted. Risks accompanying each balloon inflation include acute worsening of mitral regurgitation and transthoracic or transesophageal echocardiography of the mitral valve is performed between each balloon inflation. R)	Dog from case 1. The balloon catheter is relatively stiff and can be difficult to advance over the guidewire when positioning the balloon across the mitral valve orifice. The original septostomy sheath remains positioned within the left atrium. A second sheath is advanced through an introducer in the carotid artery and is guided retrograde across the aortic valve and into the left ventricle. S)	Same dog as in R. A guidewire is advanced through the septostomy sheath and positioned across the mitral annulus and into the left ventricular lumen. The tip of the guidewire is captured by a 4-Fr gooseneck snared that is advanced through the second sheath within the left ventricle. The septostomy sheath is then retracted. Capture and stabilization of the guidewire helps to provide sufficient tension to better advance the balloon catheter over the guidewire, through the septostomy site, and into position across the mitral annulus. T)	Same dogs as in S. Partial inflation of a balloon catheter that has been advanced along the snared transseptal guidewire. A central waist is seen at the level of the stenotic mitral commissure . U)	Same dog as in T. Continued inflation of the balloon catheter results in loss of the central waist consistent with commissural splitting. V)	Dog from case 2. Post-procedure transthoracic pulsed wave Doppler profile taken at the tips of the mitral valve leaflets in diastole displaying a reduction in peak E wave velocity (1.4 m/s) and reduction in the pressure halftime as evidenced by the now steeper slope of the E-F line. Compare this E-F slope with the preprocedure study in Panel G. d Snare catheter, Microvena Corp., White Bear Lake, MN. W)	Dog from case 1. Post-procedure transesophageal pulsed wave Doppler interrogation of diastolic mitral inflow from the transverse middle position displaying a reduction in peak E wave velocity (~1.6 m/s) and reduction in the pressure halftime as evidenced by the now steeper slope of the E-F line. Compare this E-F slope with the pre-procedure study in Panel I.
X)	Dog from case 1. Post-procedure transthoracic two-dimensional left apical echocardiographic view zoomed in on diastolic mitral inflow. There is less acceleration of blood flow moving toward the mitral valve annulus and the mitral inflow signal within the left ventricle is of lower velocity and with less turbulence than pre-procedure. Compare to panel F. The reduction in velocity is due to a reduction in the transvalvular pressure gradient following balloon dilation. Y)	Dog from case 2. Post-procedure transthoracic two-dimensional right parasternal echocardio- graphic view at the level of the aortic valve, left atrium, and right atrium. A small iatrogenic atrial level shunt persists 24 h after the balloon valvuloplasty procedure. Color Doppler reveals a small amount of left to right turbulent flow across the atrial septum at the location of the atrial septostomy site. Z)	Dog from case 1. Transthoracic two-dimensional right parasternal long axis view of the mitral regurgitation jet pre-procedure (left image) and 24 h post-procedure (right image). The severity of mitral regurgitation was judged as having not been made significantly worse following the balloon procedure. AA) Dog from case 2. Transthoracic twodimensional right parasternal long axis view of the mitral regurgitation jet pre-procedure (left image) and 24 h post-procedure (right image). The severity of mitral regurgitation was judged as having not been made slightly worse following the balloon procedure. Two-dimensional left atrial diameter and mitral valve orifice area (calculated using the pressure halftime method) in case 1 was 5.0 cm and 1.0 cm2 pre-procedure vs. 4.1 cm and 1.5 cm2 immediately post-procedure. The dog from case 1 is 19 months post-balloon valvuloplasty, remains in atrial fibrillation and receiving furosemide, enalapril, diltia- zem, and digoxin. 2D left atrial diameter and mitral valve orifice area in case 2 was 4.9 cm and 0.95 cm2 pre-procedure vs. 4.2 cm and 2.5 cm2 immediately post-procedure. The dog from case 2 is 30 months post-balloon valvuloplasty, remains in atrial fibrillation, and receiving furosemide, enalapril, atenolol, and pimobendan. Both dogs are doing well at home with no episodes of congestive heart failure since the procedures. Figure 3 Echocardiographic images from 2 dogs with severe congenital mitral valve stenosis that underwent cardiac catheterization and balloon valvuloplasty. See captions V through AA in the text for descriptions.